Joy Creek Photo Archive (c) all rights reserved This is one of the most eye-catching hummingbird plants for the rockery that we have grown. 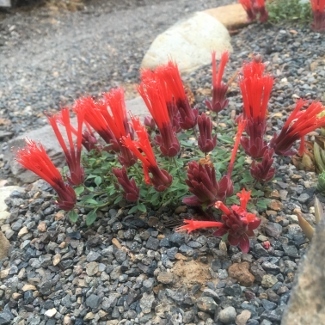 Monardella macrantha 'Marian Sampson' is a selection made by Ed Sampson of the Mourning Cloak Ranch and Botanical Garden in Tehachapi, CA and named for his wife. This diminutive species forms modest mats of small ovate leaves. In the summer, the plant is transformed as the purple red bracted floral-heads develop. The long, tubular, brilliantly colored flowers emerge from purple red buds. The flowers face upward as if waiting for hummingbirds to pollinate them. The show continues through the summer. Photo courtesy of Leslie Gover. June to August. 3-4 in. x 6-8 in. We understand that these plants receive monsoonal rains during the summer in their native habitat, so we provide them with modest water at that time. Also, drainage is essential. If these plants are lost during the winter it is usually due to inadequate drainage.